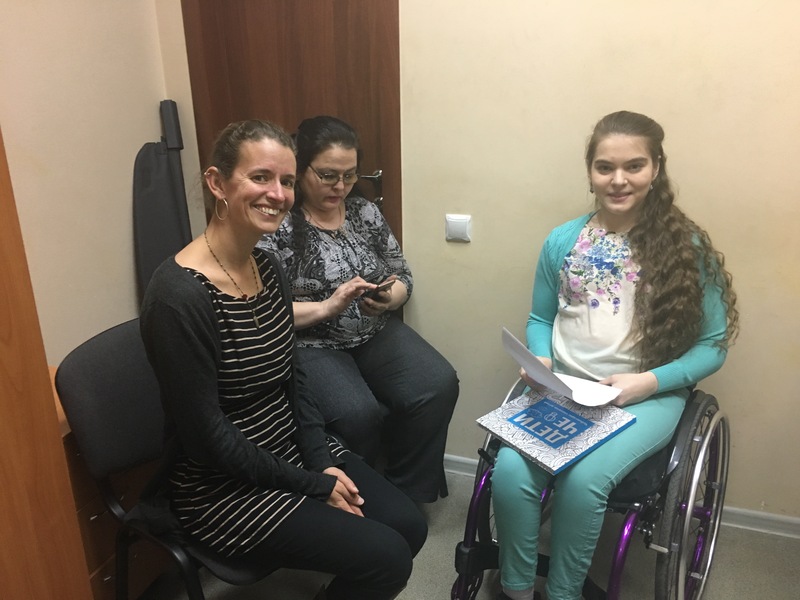 When I received the invitation from the Eurasia Foundation to visit Russia and participate in their Social Expertise Exchange (SEE) Program, which has a disability initiative underway, I jumped at the opportunity to learn what is happening on the ground for disability issues. As coordinator for Superfest International Disability Film Festival, which always strives to feature an array of international films, getting to travel abroad and learn about disability in a different national context seemed like an important enough experience to justify the stress of being out of the office nine days, and even more challenging, time away from my two young children and husband. After a 14-hour flight and a few hours of sleep in a hotel, I headed to the lobby, excited to begin my trip. In addition to four staff people from the Eurasia Foundation’s SEE program, I met four high schoolers and their teacher, all from Geneva, Illinois with no background in disability, who had won SEE’s “30 seconds to Russia” video contest. The students’ trip was paired with mine, as we were all to attend the Volga Encounters Festival in Cheboksary along with 400 Russian youths interested in filmmaking and journalism. While the students were invited to attend as participants, I was there to host a “master class” on disability in film, as well as an evening screening of Superfest’s past films. But before heading to Cheboksary, we had two packed days in Moscow. We visited the Moscow School of Social and Economic Sciences and met professor Alexander Solovyev, who studies the lack of job opportunities for people with disabilities. Responding to what he has found to be a pervasive lack of employment opportunities, he is publishing a paper that debunks some of the myths employers often believe about disabled workers. Like in the United States, stigma, not impairment, is holding back disabled people from reaching their full potential. Wheelchair access to Moscow Metro. Very few stations have elevators. As we headed into the metro, I put something together. I’d noticed a little track running along the side of the staircase earlier in the day and questioned what it was for. Seeing it a second time, I realized that it was the only means of access for a wheelchair rider to get down into the metro. 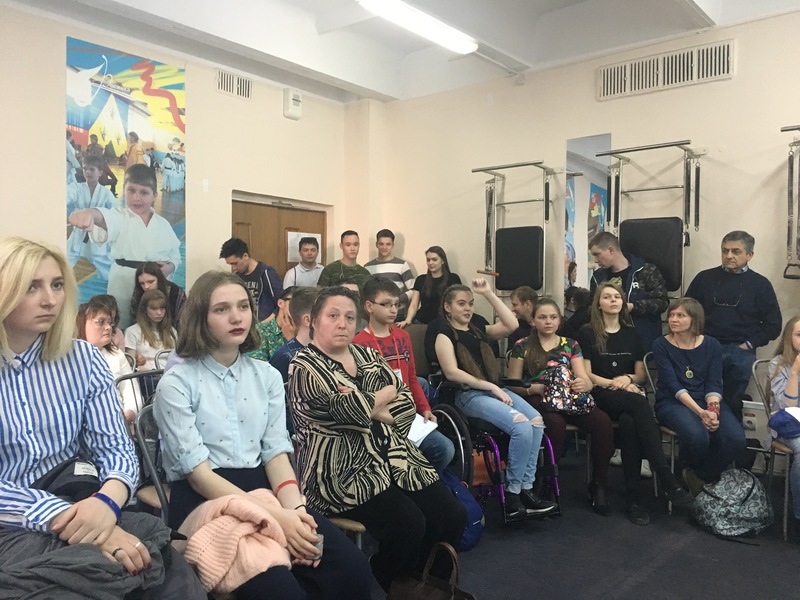 Our next stop was НАШ СОЛНЕЧНЫЙ МИР" / "OUR SUNNY WORLD," a lead organization in Russia offering community and education for autistic children and adults. The visit was wonderful (and not just because they served some amazing Russian cakes and tea). They’d recently moved into a big new building, and as they took us on a tour (or “excursion” as all the organizations I visited called it), I was immediately disoriented. Every hallway and corridor looked the same as the last, but they’d open the doors to reveal exciting spaces for ensuring that autistic people have access to experiences that go beyond services – a room where a group of women sat around making paper flowers that they showed off to us, a theater space with photos from some of their past performances, a studio for film animation,and a model classroom where students can grow comfortable in a classroom setting before being mainstreamed - to name a few examples. I hope someday we will see some of the films they are making at Superfest! In the evening, I trekked over to see Red Square and St Basil’s church. Exhausted, I returned to my hotel room, excited by how much I’d already experienced on my first day. Day 2: We headed to Перспектива/Perspektiva, which actually developed out of the Bay Area’s World Institute on Disability. Their 70-person staff (which includes many disabled people) is working on inclusive education, adaptive sports, employment, and also preparing for their next “Breaking Down Barriers,” a disability film festival that was inspired after the Executive Director attended Superfest many years ago. Meeting Tanya, Breaking Down Barrier’s coordinator, was a highlight of the trip. How often do you get to meet someone who does the exact same job as you in a different country? Close in age to me as well, we fell into a conversation easily. (ADD PIC). We swapped notes on recent films that our respective festivals had featured and compared strategies for providing the complex access features that hosting a disability film festival requires. We uncovered differences between our two festivals too. Because Moscow still has a lot of work to do to make the city accessible, their venues are often only partially accessible, and she shared how they recently had to construct an accessible bathroom outside one of their host sites. In addition, Breaking Down Barriers has definitely been more successful at receiving mainstream media attention, and often includes jurors who are well known in the mainstream Russian film scene, a group we’ve yet to fully tap into for Superfest. "Corrections Class" falls in line with "disability as tragic" trope. When I shared that I’d be giving a presentation for the Volga Encounters Festival on common tropes of disability in mainstream American films, Tanya was able to confirm that they see all the same stereotypes in Russia, and provided a list of examples. After sneaking in some last-minute souvenir shopping on the way back from our last meeting, we headed to the airport and flew to Cheboksary, the capital city of the Chuvashia Republic, over 400 miles outside Moscow. We were greeted at the airport by 5 students from the local university who were volunteering their time as interpreters for the Volga Encounters Festival. We loaded up in a van and drove to the hotel with the American teenagers and the Russian college kids, all discussing their favorite American movies and music (most of which might as well have been Russian groups, as they were all foreign to me). Still jetlagged, I headed to bed as soon as we arrived at the hotel. Day 3: The Eurasia Foundation arranged for the American teenagers to tour a local tv station, which includes a news show run by youths, and lined me up to be interviewed for their program. When I walked off the set, it was explained to me that the kids at the TV studio had set out a glass of Coke instead of water for me to drink, assuming this is what all Americans drink. And I thought I’d just be working to challenge disability stereotypes while over there! We headed to the opening ceremony for the Volga Encounters Festival, which involved not one, not two, but THREE songs written specifically for the festival I was about to attend by past attendees. Though I couldn’t understand any of the lyrics, my excitement for the festival had still increased by the end. We then rode a boat to the main location for the festival, a children’s camp in a forested area off the Volga river that reminded me of my days in the Girl Scouts. I received lots of attention from Russian kids attending the festival while on the boat, who were eager to meet an American. However, by the time we reached the camp, word had spread that there were also American teenagers traveling to the festival, and while their celebrity status grew, so I was no longer the main recipient of all that celebrity attention. Day 4-7: For the next few days, I hung around the festival, eating delicious food and giving presentations. I co-presented a master class with Russian filmmaker Georgii Molodtsov, who makes PSAs that change perceptions of disability. Together, we laid out strategies for avoiding the common stereotypes of disability through film. After a sparsely attended workshop, I was pleased to see a full room for my evening screening of Superfest films. It was an ironic venue: a repurposed gym, surrounded by exercise equipment, but as the camp was originally built for health and fitness, spaces like this were what the organizers had to work with. I worried in advance: would the films that we select for our Bay Area audience resonate in a different culture? Fortunately, the first hand raised responding to the first film I’d screened (“The Interviewer,” Best of Festival 2014) put my concerns to rest: “That was the best film about disability I’ve ever seen!” The success of the session, especially in contrast to the low attendance of my master class, reminded me what I love about Superfest; films provide such an inviting, accessible way to transform people’s thinking about disability. During my downtime, I continued to meet with some of the festival attendees. I particularly enjoyed meeting two students with disabilities. One student, Simon, shared a dream of starting a camp in Russia for kids with disabilities and envisioned it as a place where American kids with disabilities would come to attend too. I also met Ksenia, a young filmmaker in a wheelchair who was interested in documenting the challenges and strategies of traveling with a disability. She lit up as I told her about John Hockenberry, a wheelchair rider like herself who is an NPR journalist on “The Takeaway” and encouraged her to read his book Moving Violations, which includes experiences of his travel around the world. By the closing ceremony, which included a remarkable magic show, I was missing my kids and had picked up a cold, so I felt ready to return home. Day 8-9: After a day of sight-seeing in Cheboksary, I flew back to Moscow and then took off for San Francisco early the next morning. So how do I take what I observed and use the knowledge I gained to help me better do my work? I imagine I’ll be considering this question for some time, but one lesson from the trip has preoccupied a lot of my thinking since I’ve returned. In hosting Superfest, we receive a fair amount of films that might be very significant in their home country, but are rejected because in the Bay Area, the content will seem too basic. For example, we’ve seen a number of non-US submissions about how minimal access is in the filmmaker’s country and the journey to increase access. Our jurors often call these films “Disability 101,” whereas Superfest looks for “disability 201,” seeking to engage our audience with new issues in disability that go beyond basic access issues, personal journeys to accept disability identity, and the like. Yet, as I traveled in Russia and learned about where the Russian disability movement is right now, seeing what access looks like in the metro for example, or learning that inclusive education has only recently been mandated and still only happens in about 2% of Moscow schools, I realized that we in the Bay Area could benefit from more opportunities to learn about what is and isn’t being provided for disabled people in Russia and other countries outside the US. Whether or not Superfest is the right place for sharing these stories, I’m still pondering, but regardless, I know that I benefited tremendously from this rare and privileged opportunity to learn about the experiences of disabled people outside my community. We cannot claim a victory for the fight for “disability equality” until it has reached disabled people in the United States, Russia, and everything up, down, and in between. Many people with disabilities have made this point already, but there’s nothing like leaving the bubble to help you see it. Emily poses with Eurasia Foundation's SEE staff. The views and opinions expressed in this blog are those of the author and do not necessarily reflect the official policy or position of the US-Russia Social Expertise Exchange or Eurasia Foundation.